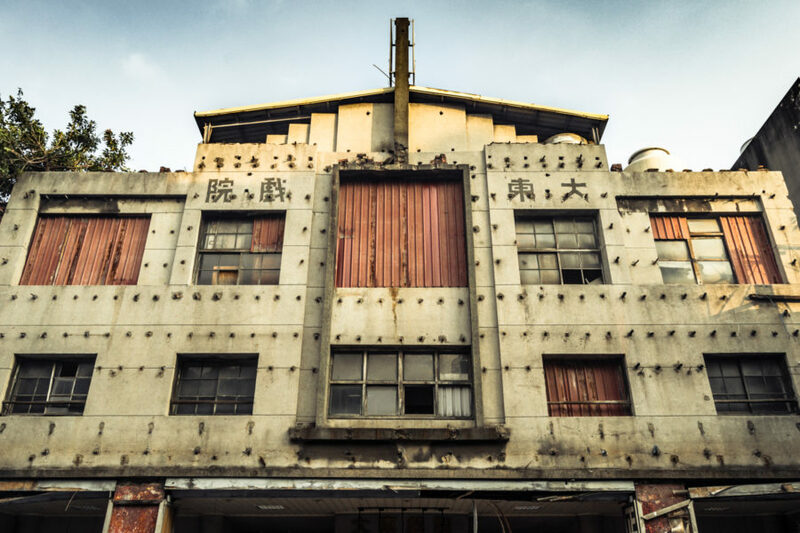 Zhōnglì 中壢 is home to a surprising number of disused and abandoned cinemas, relics of a lost age of theater in this conurbation of half a million sprawling across the central Taoyuan Plateau 桃園台地. 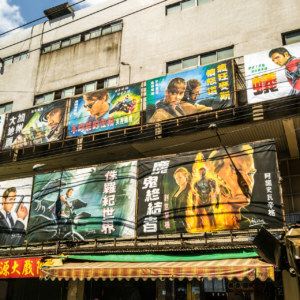 Decades ago there were nearly two dozen standalone movie theaters in town—but only Zhongyuan Theater 中源大戲院, one of two in Taiwan still displaying hand-painted movie posters, remains open. 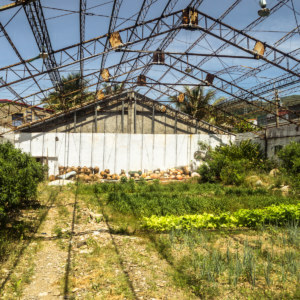 Most of the others have been renovated beyond recognition or demolished, but several more are derelict, hard-worn subjects of entropy. 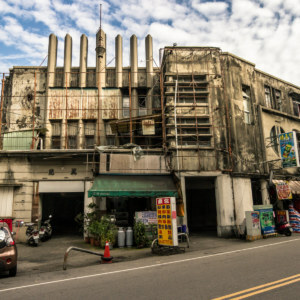 Among these relics there are none greater than the imposing Dàdōng Theater 大東戲院 (literally the “Great Eastern Theater”), former anchor of Zhongli’s long-vanished Cinema Street 戲院街. The brutal exterior of the Great Eastern Theater at dawn. Five dead eyes gazing at the street and a poster for V for Vendetta (2005). I chanced upon Dadong Theater while wandering around Zhongli sometime in late 2015. 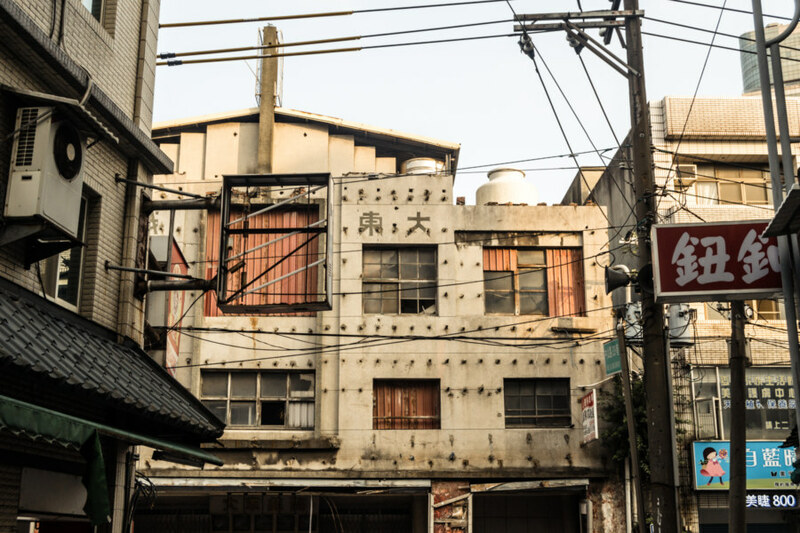 I was in town to search for an apartment—and to get a feel for what would eventually become my winter residence. 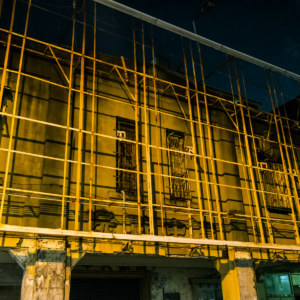 Straying from the brightly-lit streets of the commercial district west of the train station I soon noticed this fortress-like structure looming over a dark intersection. At that time I had only recently acquired an interest in Taiwanese movie theaters so it seemed like a serendipitous discovery. 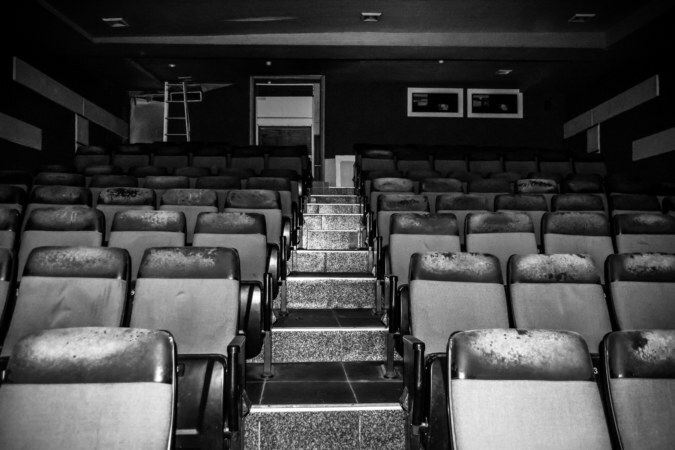 I resolved to return—and mere weeks later found myself creeping into the dimly-lit lobby, ready to elucidate the mysteries of a movie theater utterly detached from the human world for nearly a decade. 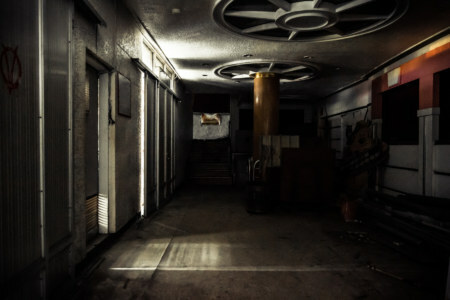 The dark entrance, light seeping in through the metal shutters. The outlines of a snack bar are barely discernible in the murky gloom. 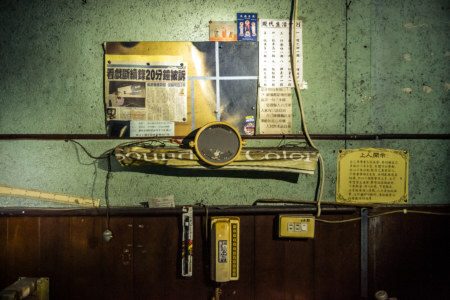 Newspaper cutouts, regulations, and Buddhist charms on the back wall of the first projection room. A trailer for Batman Begins, released in 2005. 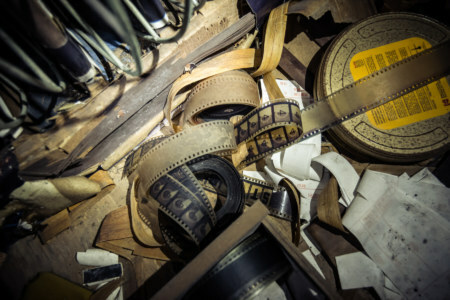 A total mess on the floor of the first projection room. 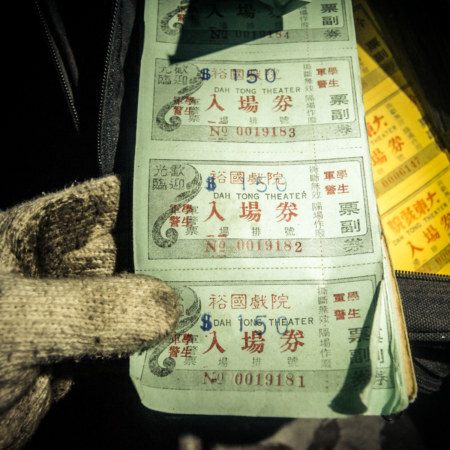 Business records indicate Dadong Theater was founded in 1956. 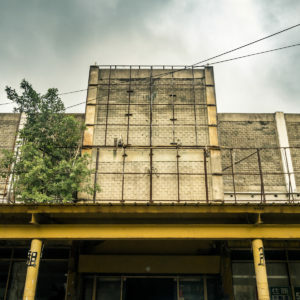 I harbour some doubts about whether the physical structure of the theater is quite so old—there’s a good chance it was renovated or moved into a newer building in the 1960s or 1970s, but little information exists to corroborate such speculation. 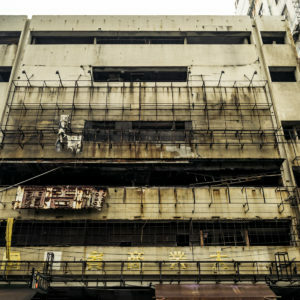 What I’ve gleaned from nostalgic threads on Facebook and PTT suggest that Datong Theater was one of several cinemas along this stretch of road at the heart of Zhongli’s old entertainment district1. 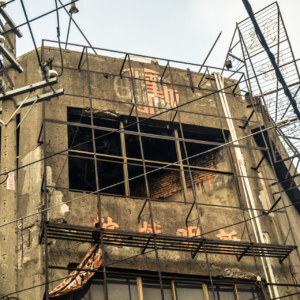 Many Zhongli residents recall the buzz and excitement of seeing Titanic (1997) at Dadong Theater, but it later became a second-run theater (二輪戲院) with discounted tickets in its dying days. 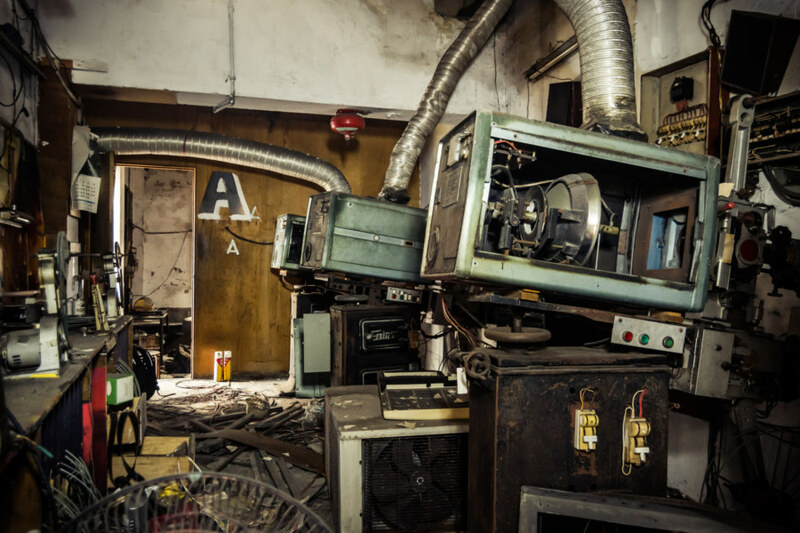 The theater contains a full set of original projectors staring into the nothingness. 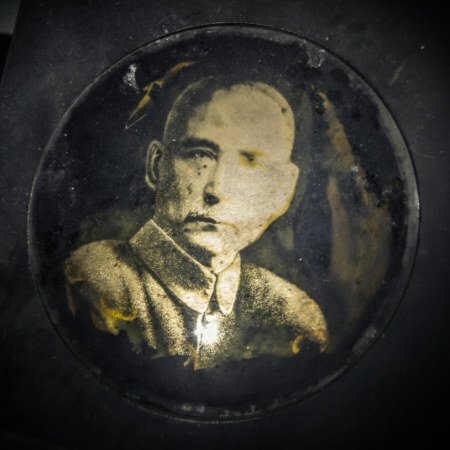 This one is marked “bùdòng 不動”, or “don’t move”. 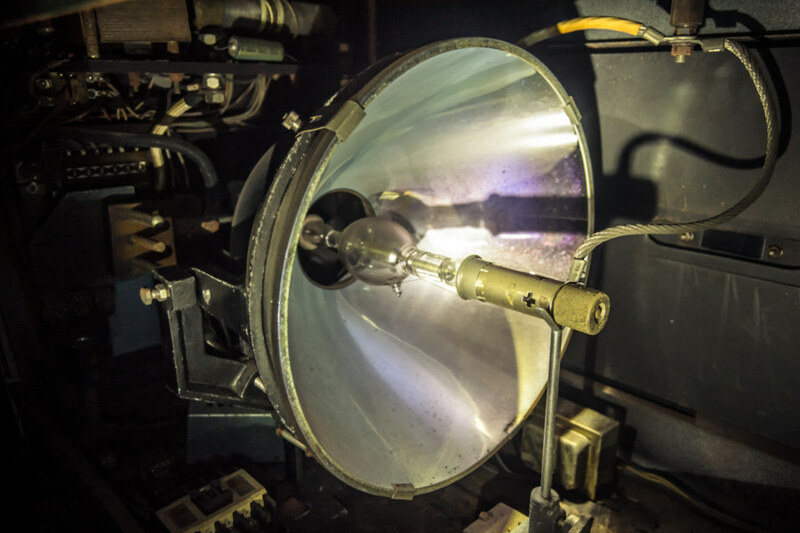 A closer look at the xenon arc lamp inside one of the projectors. I’ve been informed these bulbs are delicate and may explode if handled roughly. 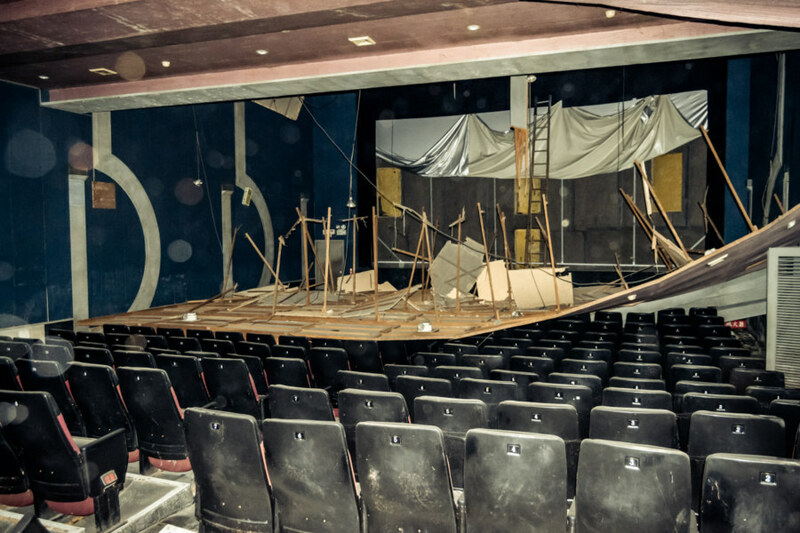 Inside the ground floor theater, a dank place of mold, dust, and water damage. 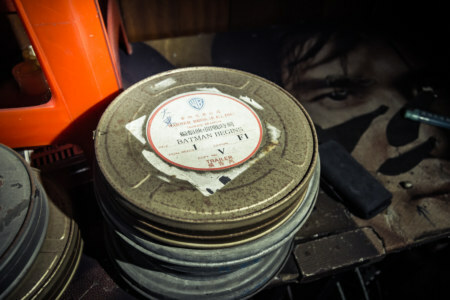 The approximate date of closure can be determined from the films advertised outside and a calendar found in one of the projection rooms. Both lines of evidence indicate the final showing must have been sometime in the spring of 2006. The building was sealed thereafter—and I have a strong suspicion I may have been the first person to set foot inside since the final curtain call. 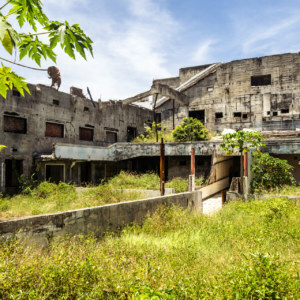 The access point was a wooden door that had fallen apart after years of exposure to the elements—but it was only open for a brief period of time, and has since been sealed by a metal barrier. I made multiple visits while it was feasible to do so, sometimes with company. 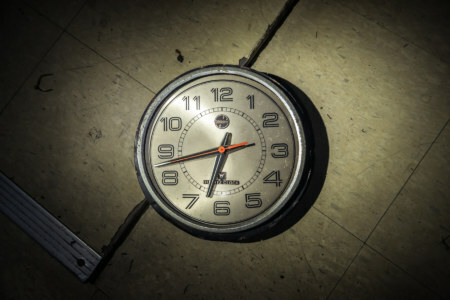 As always, we were respectful, abiding by the urban explorer’s code: take nothing but photographs, leave nothing but footprints. The ceiling collapsed at some interminable point in the past. 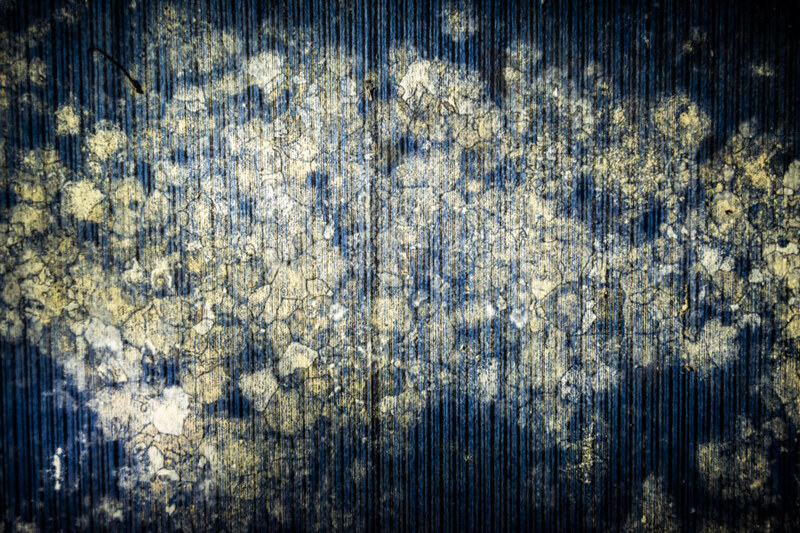 Beautiful patterns of decay on the walls of the old theater. 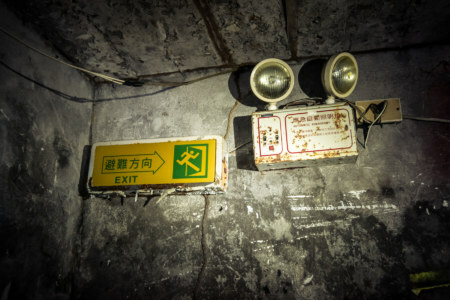 An emergency exit in the old theater. From the ground floor theater it is possible to access an empty basement level. 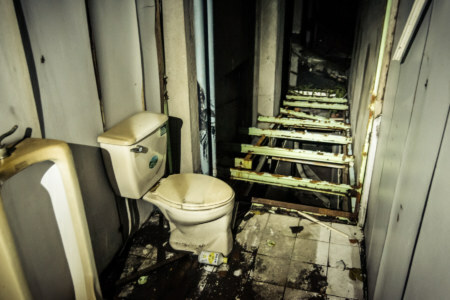 A perilous washroom on the second floor of the theater. One wrong step and you’ll be over the edge. Inside another theater deep within the building. This one is far removed from the elements and is fairly well-preserved, red velvet drapes and all. 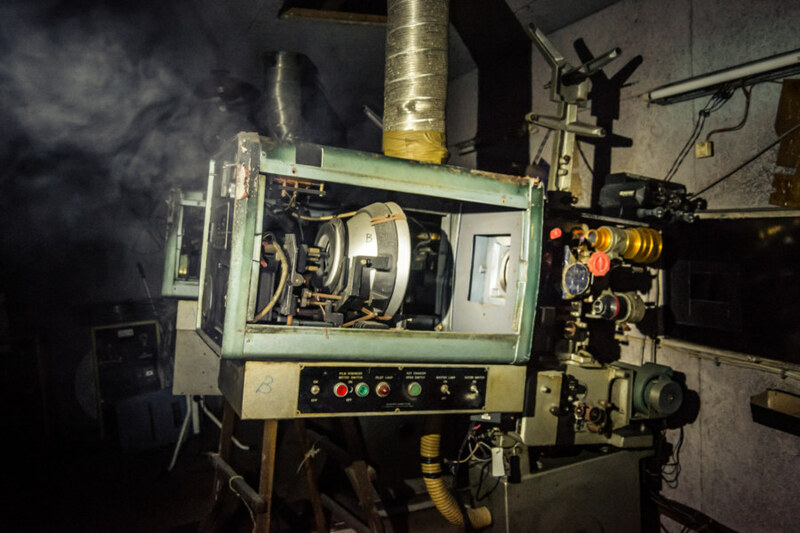 Another look at one of several projectors deep within the confines of the old theater. Unlike many other theaters I’ve explored this one is a place of darkness, with no natural light except in the office and lobby at the front of the building. 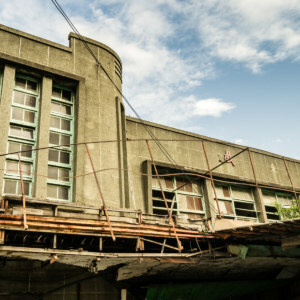 Although there are numerous leaks throughout the building—some of which have led to the decay and collapse of parts of the internal structure—the rooftop remains more or less intact. 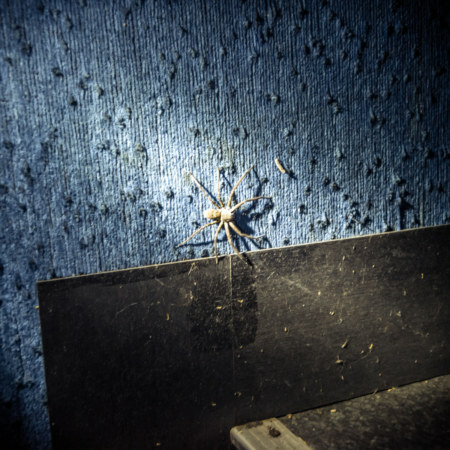 Mold flourishes through the building and large Huntsman spiders stalk the dark corridors for whatever prey they might find. 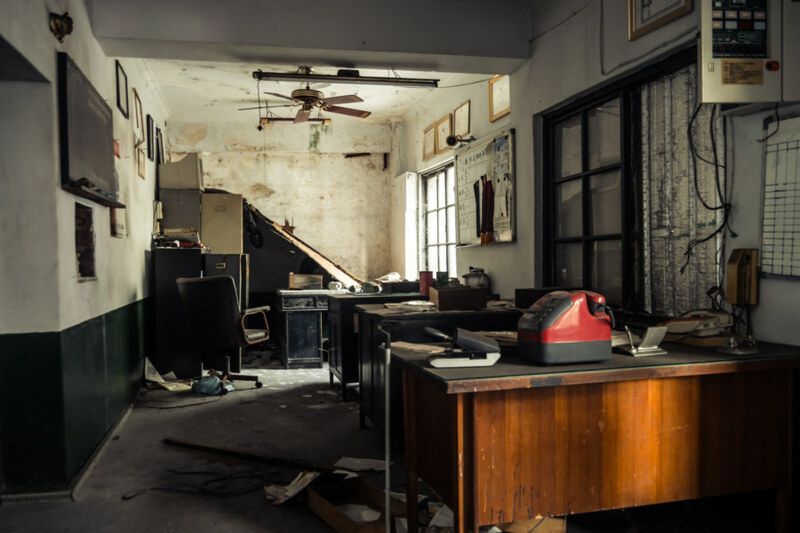 Deep within the building there are no sounds, only a strong, steady silence far removed from the realm of human activity. We become ghosts on film, shrouded in smoke. 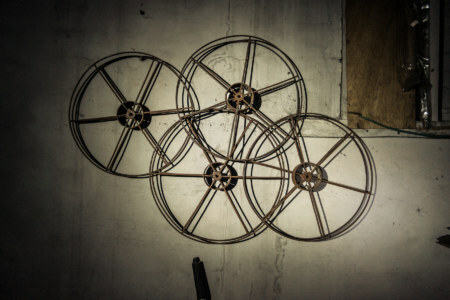 Film reels on the wall. 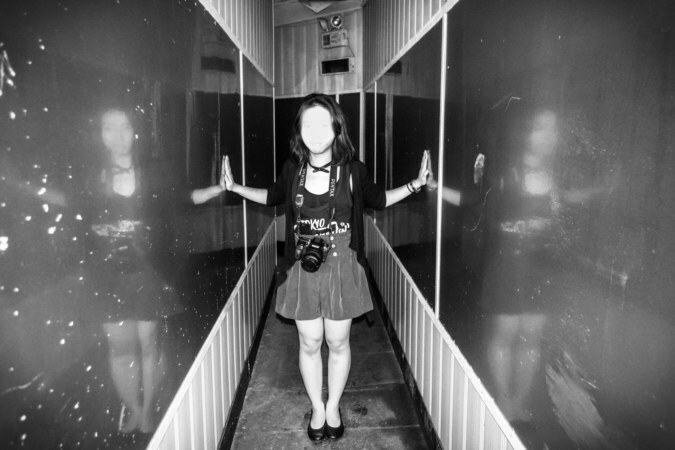 Nothing true in this haunted hall of mirrors. Another small cinema in the upper reaches of the building. 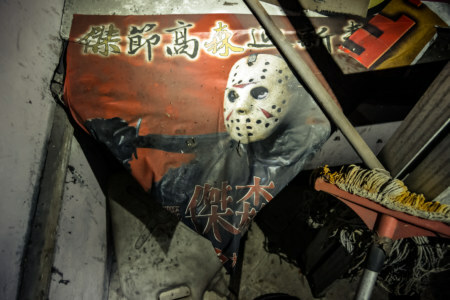 An interesting poster to find while stalking through the dark depths of the abandoned theater. Looking into the guts of the machine in a utility room near the front of the building. 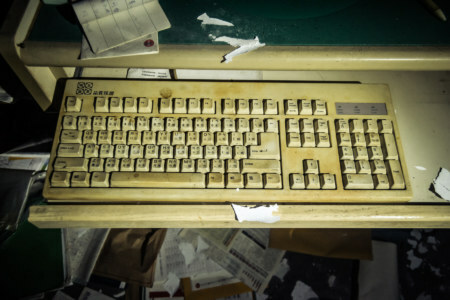 Archaic data entry device. 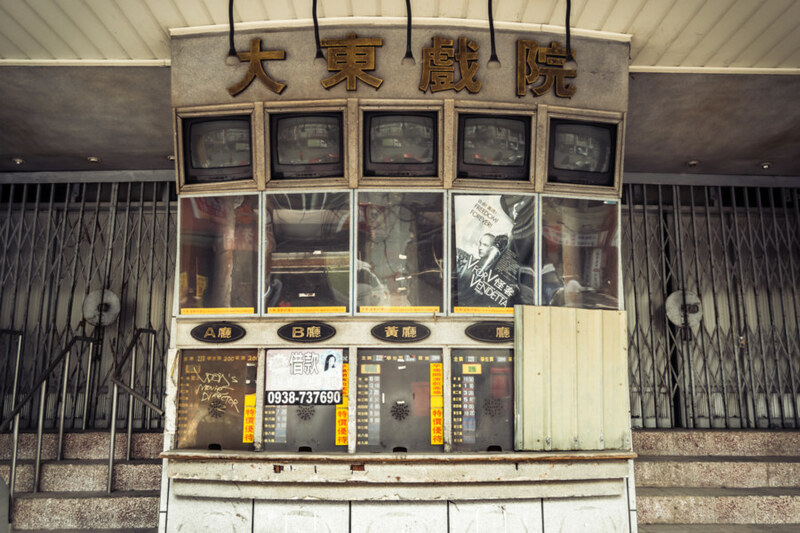 Looks closely and you’ll see phonetic and radical Chinese overlays. 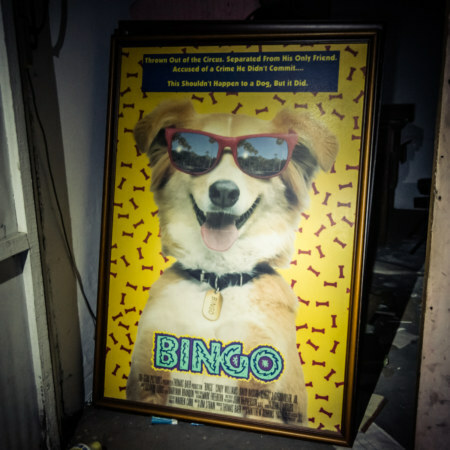 Fancy meeting you here, Bingo (1991). Huntsman spider in the darkness. The front office by day. Portrait of a vanished nationalist. 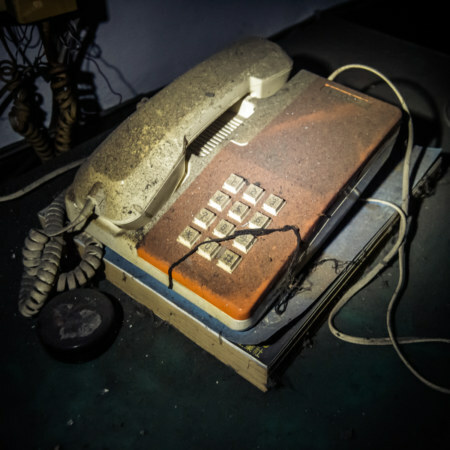 A standard-issue phone found in many abandoned theaters. Inside one of the upper projection rooms at the front of the building, the only place that ever sees any sunlight. 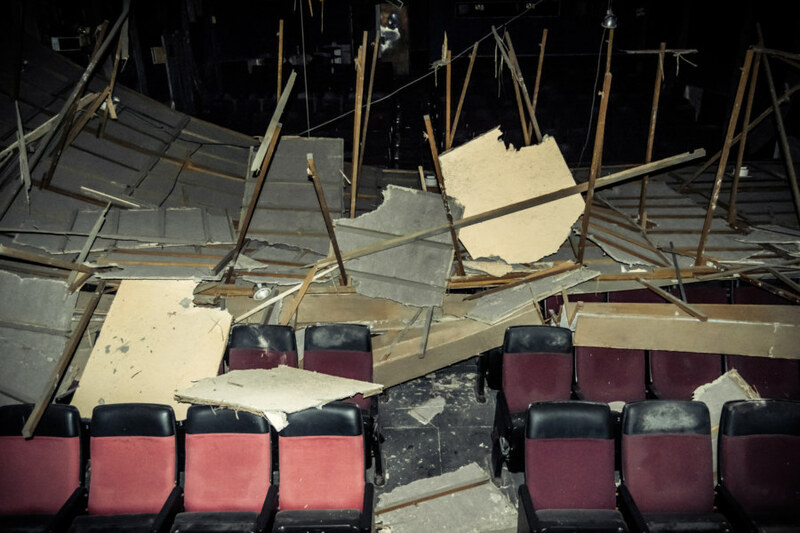 There is no future but destruction for a theater like this. 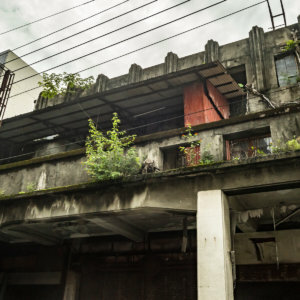 It has little historic value, despite running for half a century, and I would expect it to be demolished in the coming years as the Taoyuan Metro expands into the city, revitalizing the area and raising property values. 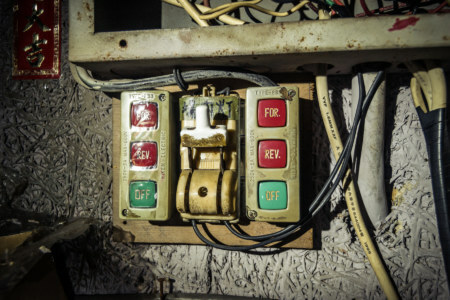 These images document the last vestiges of an era already disappearing into history. One last glance at this haunting cinematic fortress. 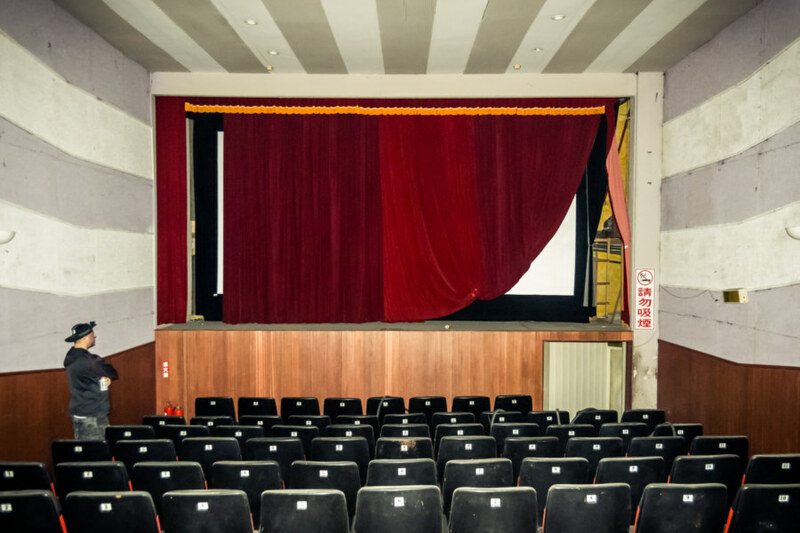 If you’re curious about the movie theaters of Zhongli I encourage you to read my reports about Zhongyuan Theater 中源大戲院 and Xinming Theater 新明戲院. 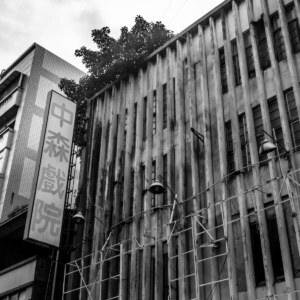 Traces of several other theaters remain around the city but there are none more important than these three. More photos and information in Chinese can be found here, here, and here. 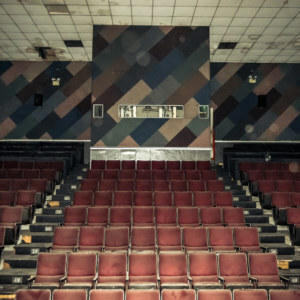 Finally, I should emphasize these photos were taken years ago and this theater is no longer accessible. Nice shots. It’s pretty intact, all things considered. 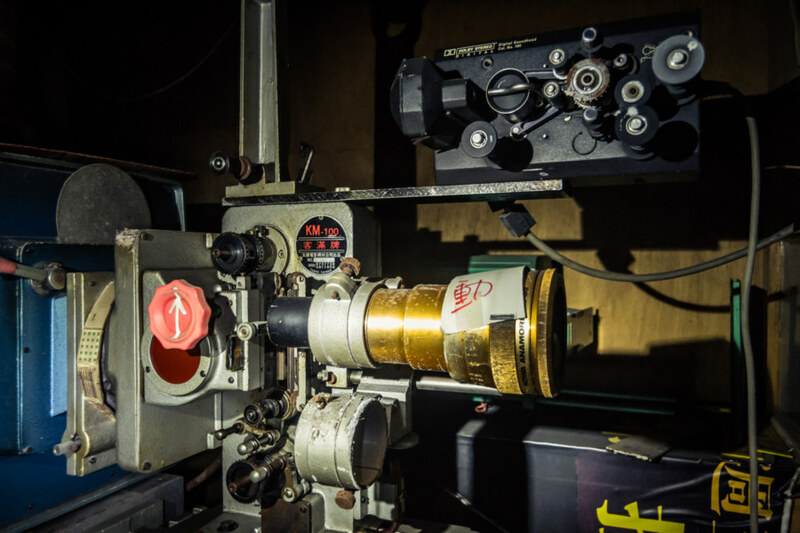 As a former projectionist, one thing that stands out is the fact that there appear to be three projectors, when only two are needed for most films. Could be they needed a backup, they ran prerolls on a separate projector (instead of splicing them onto the beginning of the first reel) or there was one projection booth for two separate theaters. 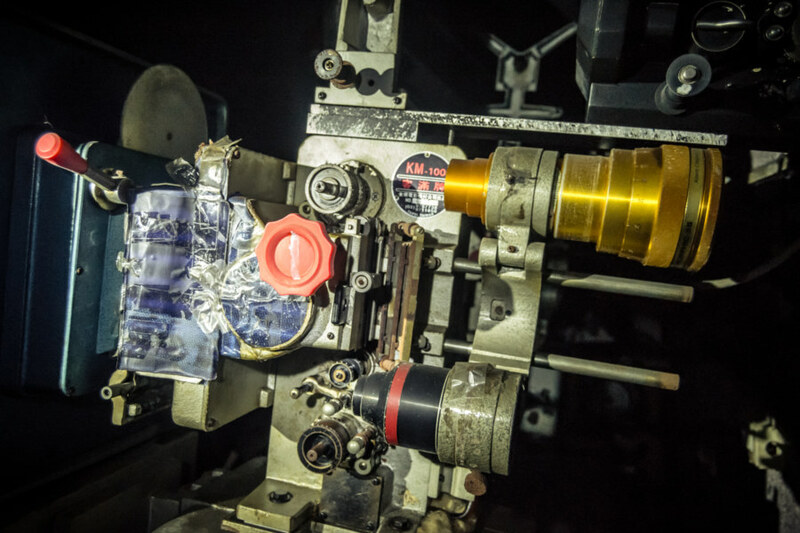 The projectors also have ductwork for removing heat or cooling the machines. I never saw these in the Boston area but we also didn’t have subtropical conditions to work in. 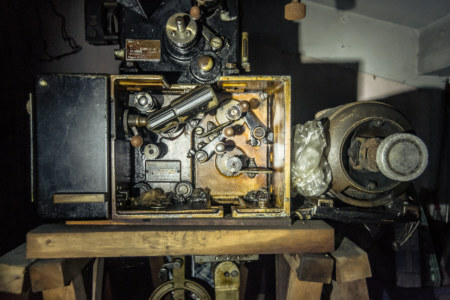 The bench behind the projectors has rewinding machines but I don’t see any obvious splicing areas, usually a metal groove to hold the film and a diagonal slot where the razor goes through, and sometimes some sort of tape dispenser.